Advantech has been providing both the military and aerospace markets with industrial-grade COTS building block products and services for many years. With the specific goal of simplifying new product development efforts. 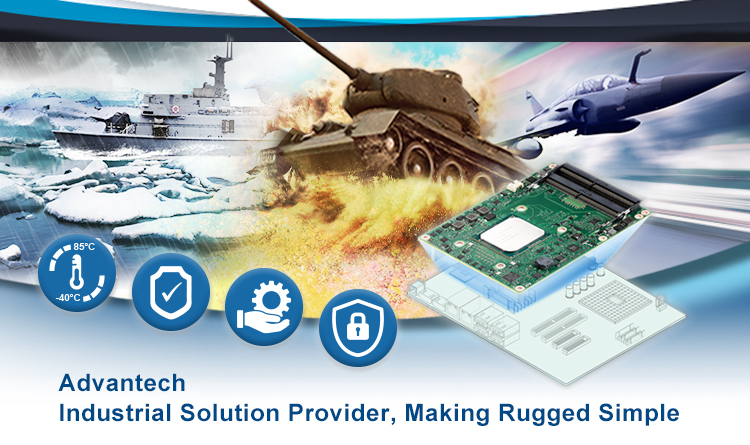 Advantech’s Computer-On-Module (COM) products provide the perfect foundation for new rugged product designs because they are purpose built using only industrial components, offer extensive on-board features, can being tailored to fit application specific requirements, and are designed for use in rugged environments. Industrial COTS products can be enhanced to meet extreme environmental conditions experienced in the air, on land, or under water. Features like TPM 2.0 offer the latest security for mission critical applications. With a long list of comprehensive features, customization capabilities, coupled with tight revision con trol and 7-15 year lifecycles, Advantech’s Computer-On-Module (COM) building block technologies can empower your mission critical solutions for years to come. For more info on these products, please call our toll free-line 1-877-825-4146 or email us at ECGInfo@advantech.com.tw. Feel free to share the news with your colleagues, customers, partners and friends.